Her candid snaps and hilarious Instagram stories allow a true insight into her world, along with her real and relatable voice. 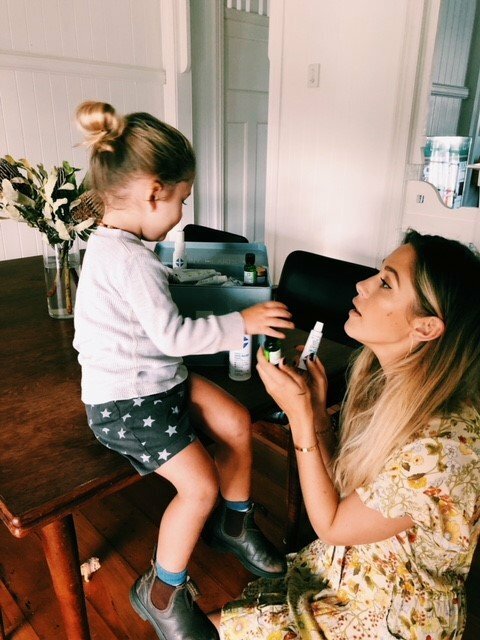 As a mum of two and a Byron local, we asked Ruby to share with us her go-to first aid products when it comes to her family’s health. As a Mumma of two young boys I have already had my fair share of hospital and doctor visits, and along with that, I’ve learnt a few tips about how to avoid the waiting rooms at all costs. If you’re anything like me, staying calm is the first challenge. If you find you’re having trouble with that, the best thing I can suggest is taking a first aid course. They prepare you for burns, choking, sudden seizures, poisoning, bites, allergic reactions and a lot more life-saving skills. I think everyone, parent or otherwise, should undertake a first aid course at least once! They are generally affordable, and peace of mind is priceless. Also if you live rural like me there are a bunch of online courses you can take. Depending on where you live and the age of your child there might be some uncommon risks that you should be prepared for, as giving CPR to an infant is quite different to giving CPR to an adult. Even if you are competent in first aid, if there is an emergency you should always contact the emergency services. Once you’re confident in the practical side of first aid you also need to prepare for the minor to the major incidents. With my toddler racking up the number of scrapes and bumps, having a first aid kit handy is a must, and in my time, I’ve tried a few product options. mundicare is an Australian healthcare brand with a range of natural first aid products. Through the combination of nature and science, their first aid products are natural and sustainably made with highly distilled melaleuca oil, sourced from my hometown Byron Bay. I’ve tried their products and they are a must in your home and on-the-go first aid kits! Melaleuca (Tea Tree) Oil has been used for treating injuries for centuries by indigenous Australians due to its natural skin healing benefits. It’s since been heavily researched for its natural antimicrobial, anti-inflammatory and antifungal properties, which make it great for treating various skin conditions from cuts and scrapes, to bites and stings, to burns, to acne. Natural treatments are a growing trend in Australia, with research showing 1 in 2 Australians preferring natural products whenever possible. The first line of defence in the body is the skin and melaleuca oil is an ideal therapeutic choice that isn’t harsh on sensitive skin meaning it is suitable for the whole family. mundicare offers a range of natural first aid products designed to help treat a variety of skin conditions, from cuts and scrapes, to bites and stings, to burns, to rashes and irritations to minor wounds. Given that the oil is grown in the Byron hinterland, just a short drive from my mother’s house, I was curious to explore just how these ingredients are grown, sourced and distilled into the products currently tucked away in my family’s first aid kit and I was fortunate enough to do just that! I recently travelled to the Byron farm where mundicare’s Melaleuca oil is sourced and met the talented and dedicated farmers behind the melaleuca oil who taught me all about their natural harvesting process, making sure that no harsh chemicals are used during the growing process. It was such a treat learning about the many uses of the oil whilst seeing it all happen in front of me, first hand. mundicare’s First Aid products such as the Itch Relief Gel and Burnaid are perfect for my beach day bag as they help relieve itchy bites and stings or sunburn that potentially come with a day at the beach. The Antiseptic Spray is a must for the home care kit as it protects all of my family’s cuts and scratches from infection. The Skin Relief cream and powder are a must for the hotter months in Byron as they protect my kids from any chafing or rashes that pop up. I personally use spear by mundicare as my preferred natural treatment, and combined with vital first aid education, it protects me and my family’s everyday mishaps. 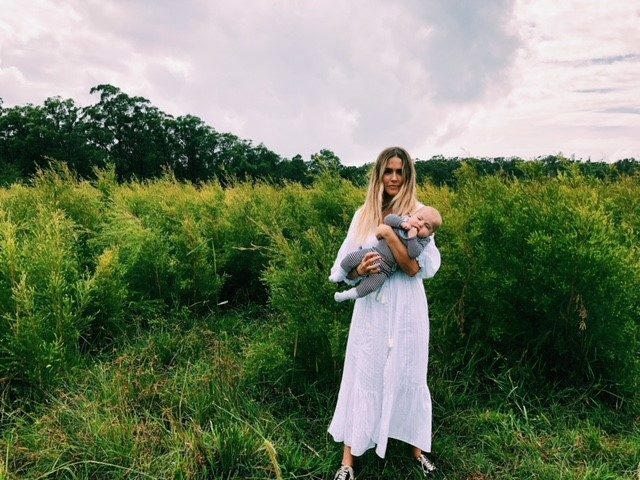 I spent the day exploring and educating myself on more natural ways to protect my family at my local melaleuca oil plantation just down the road from my mama’s house in Byron Bay! This epic plantation nurtures, harvests and refines all of the melaleuca oil in the mundicare First Aid range! And seeing as I have the world’s most accident prone child it only seemed fitting to educate myself about how these handy first aid remedies are made. This child is possibly the most accident-prone child I know, I’m honestly surprised we haven’t had a broken bone yet! He constantly has an array of cuts and bruises and has no fear when it comes to pushing the limits. Is anyone else’s child this nuts? But as per usual it’s mundicare to the rescue, with its natural antiseptic spray that cools and soothes his cuts and scrapes and supports healing! One of my medical box must haves! Natural is always better in my eyes, and in most cases less is more. 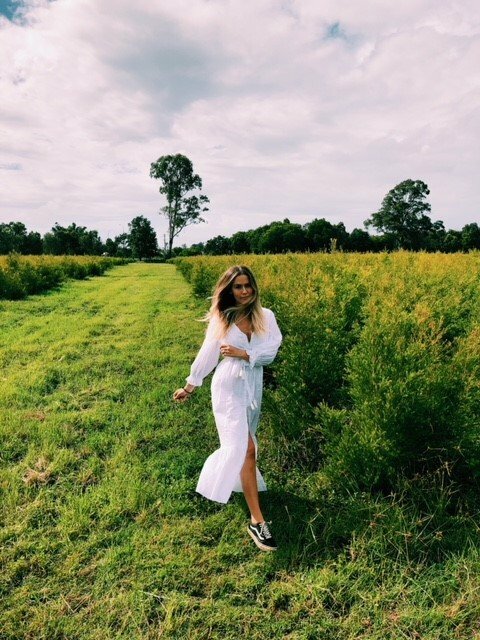 Mars and I soaking up the melaleuca tree goodness at the farm where mundicare sources all of its melaleuca oil, just down the road from me in Byron Bay! This little miracle oil doesn’t get enough recognition! From cuts and scrapes, to the odd pimple, to stings and bites, the mundicare range is my go-to for first aid. Always read the label. Use only as directed. If symptoms persist, see your health care professional. ® MUNDICARE is a registered trademark.